If Steam feels seriously threatened, for example by the increasingly bold Epic Games Store, Gabe Newell will press the red button and launch the nuke – Half-Life 3. And then... Nothing will happen. Sorry, Gordon, nobody cares if you come to the party. 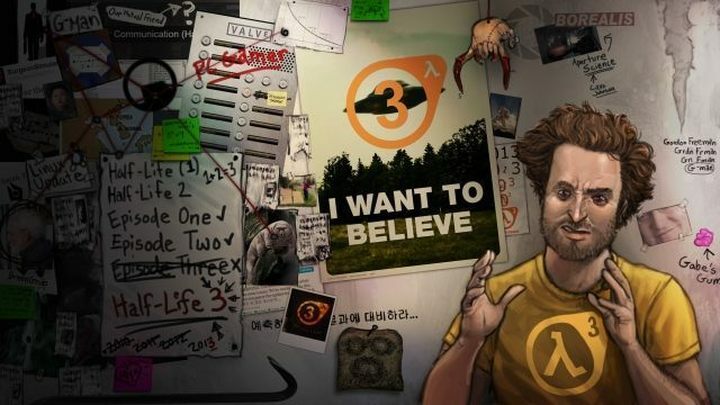 Nobody is, of course, a bit of a strong word, but for me, the opinion that a Half-Life 3 release would be a phenomenon of global magnitude, is just naive. Personally, I venture to say that Valve is currently incapable of creating a game that could meet the exorbitant expectations of the shrinking lot of believers. Even more doubtful is Gabe Newel company’s actual willingness to even try. Still, even if this actually happened, it could turn out that players don’t give a hoot anymore, and Half-Life 3 would achieve something like the bottom quarter of the top 20 best sellers. Once, the whole Internet was waiting for this little logo. Today... today, only a handful of the biggest fans are still hoping. The rest is an indifferent sea. Since this is an opinion, I could go a bit avant-garde and finish here, satisfied with the conclusion “Nobody cares about Half-Life 3.” However, since I’ve made the effort and researched the subject, I might as well go ahead and share some hard data with you; don’t expect a cliffhanger, though, because Gordon Freeman is no longer the messiah he was over the last decade. Let’s start at the very beginning, i.e. the sales figures. Half-Life 2 really was a smash hit. In 2008, four years after the release, Valve boasted 6.5 mil copies sold. That was a satisfying result 11 years ago, but the industry is expanding exponentially: the newest God of War went to 5 million players in a month; The Witcher 3 – 6 million; Final Fantasy XV – 6.5 million. Then you have GTA V, which achieved a ridiculous 85 million copies sold in four years. Sure, Half-Life 2 was a success, but it wasn’t a spectacular success, nowhere near All-time Top 10. The industry has grown, unlike the population of Half-Life fans, who have become a niche. 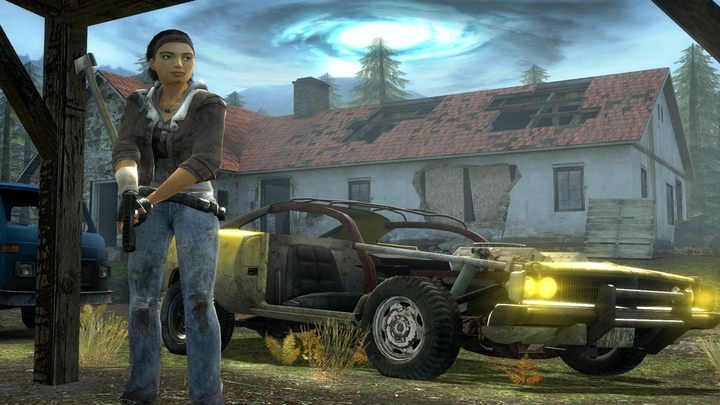 If you think Half-Life was Valve’s most successful game – think again. Counter-Strike: Global Offensive, before it went free-to-play, reached 40 million users on Steam; the free Dota 2 is played by a couple hundred thousand people a day. Right now, about 10 million users have Half-Life 2 in their Steam libraries. That’s quite a lot, no doubt... but there always is a” but.” The great majority of these players never reached the game’s finale. The other expansion to Half-Life 2 boasts 6.23 mil players on Steam, with a 60% completion ration (not half bad!). This means that the number of people, who actually know at what point of the story Half-Life 2 ended, is around 3.7 million. According to 2017 data, there are about 2.2 billion players around the world right now. Assuming that everyone, who finished Half-Life 2: Episode Two is still alive, they comprise a minority of 0.16% of the global gaming population. Less than 4 million players reached the end of the second episode of Half-Life 2. The number is less than impressive for today’s standards. By comparison, 2.17 million players reached the finale of BioShock: Infinite on Steam alone – remember the game sold much better on consoles. I’m not trying to say Half-Life isn’t a big franchise per se, or that it never was very popular. It just doesn’t stand out anymore. The plummeting interest in Half-Life 3 is perfectly evidenced in Google Trends, too. Valve’s creation has fallen behind a long time ago, outrun by Call of Duty, Far Cry or Borderlands. 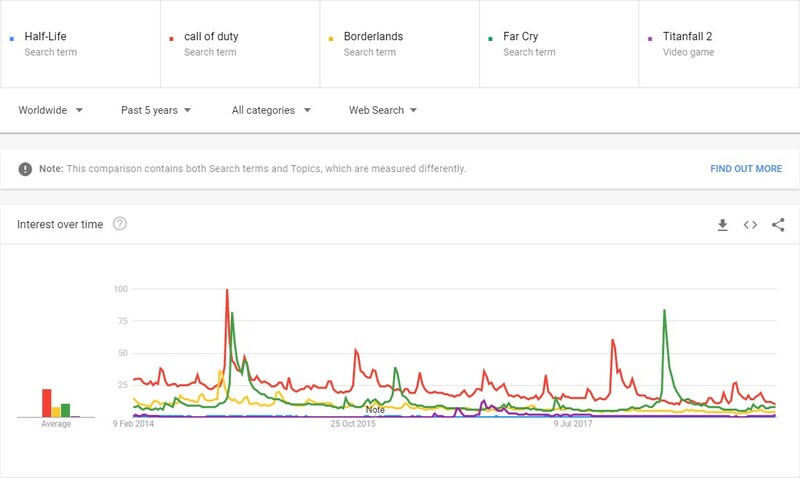 During the last five years, even the name Titanfall 2 was more often googled than Half-Life. Stacking it against the biggest games from Mojang, Riot, Epic or Rockstar is really beating a dead horse. See that? That thin blue line is Half-Life. Younger competitors arouse much more interest. Some of these players did, by the way, give Half-Life a chance, but it usually was a short-lived affair. I played for 2 hours and uninstalled it. The game rated really high in most rankings, so I thought I’d give it a shot, and I was disappointed. The game is plain boring and has almost no story – bizarre because there was a lot of fuss about it. A few mundane dialogs every now and then you keep going/driving forward. Annoying spiders and those worms that keep jumping. The locations aren’t particularly interesting. There was no incentive at all to pursue the ending. Just a shooter – not much more. You can give it a try, but I don’t see a reason why you should. It’s dynamic, there’s lots of shooting, but not much beyond. Another overrated title that made a huge career. Innereslicht, on our Polish forum at Gry-Online. If you’ve arrived in City 17 when you were 17 years old, just like myself, you’re 32 today. At the time, you weren’t even particularly concerned about high-school finals. Today, you may have kids and a bank loan – hell, you may even be already divorced. Perhaps you still remember how awed you were by the open spaces and the atmosphere created by the game’s artistic director, Viktor Antonov (who left Valve a long time ago and has since worked on games such as Dishonored). But over the years, you were enamored by so many different titles, that the whole affair with the Combine and the Resistance doesn’t seem so thrilling anymore. I myself eagerly anticipated Half-Life 3, mainly because of my huge sympathy for the first installment, which blew my socks off at the time. I was tantalized by Gabe’s cameo in the clip for Clang’s Kickstarter, the one where he’s forging a crowbar, hitting it three times before saying “it takes time.” I thought that HL3 could be a SteamOS exclusive, or a VR experience from Valve. Nowadays, Half-Life is in the same box in my head with, say, Duke Nukem 3D – it was cool, but why go back? Be honest, guys and gals. You’re not holding your breath anymore either.